The donation is free, but we suggest to donate at least 4€. This will allow us to support both the author’s work and the site maintenance. The payment is via PayPal. Paypal accepts the majority of the debit and credit cards without a PayPal account. We don’t guarantee the refunds, but we’ll do everything we can to solve any possible problem. Our purpose is to have a fully satisfied user. After donating, you’ll receive the download link via e-mail. If you don’t receive it immediately, please check your spam folder. Cizre, extreme south-east of Turkey. On 4 September 2015 a measure of the governor of Sirnak declares a state of emergency, a curfew of 24 hours 24 is imposed on the entire population. No one can leave the house, the hospital is closed as well as all commercial activities. There is no water or electricity, cell phones do not work, Cizre is isolated from the world. It begins the siege. The story of what happened in the 9-day curfew told directly by the people of Cizre. 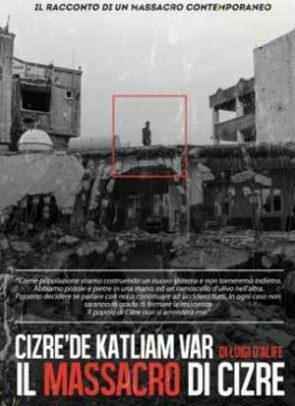 A journey through the streets of the neighborhoods where they are consumed very serious violations of human rights in the attack launched by the Turkish army against men, women and children that caused 28 deaths and over 100 injured. OpenDDB is a project of Smk Videofactory cultural association - CF 91368490370. All the content on this site is licensed under a Creative Commons Attribution 4.0 International license.